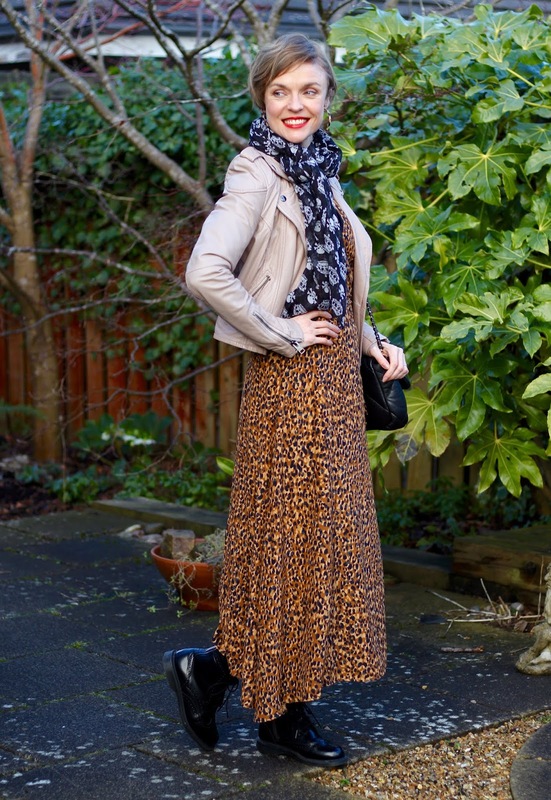 Leopard Midi Dress and Cropped Leather. Embarrassing Mums! I love an outfit that provokes a reaction and this one certainly did that! This particular outfit made my middle daughter cringe and guess what? Her horrified face made me smile! In your 40s, the disapproval of your teenage daughter is much like the disapproval of your mum when you were a teen yourself. If my mum disliked something then it got a big thumbs up from me! Everything from t-shirts to boyfriends. My daughter is normally forthcoming with her opinions and I do appreciate them, but sometimes getting your daughters approval is not all it's cracked up to be. Sometimes a horrified look is all you need to know that you've done something right, for yourself. Style and fashion should never be about the approval of others, only your own happiness. Today's look is simple, comfortable and easy to wear. A classic combination of a midi dress and leather jacket. 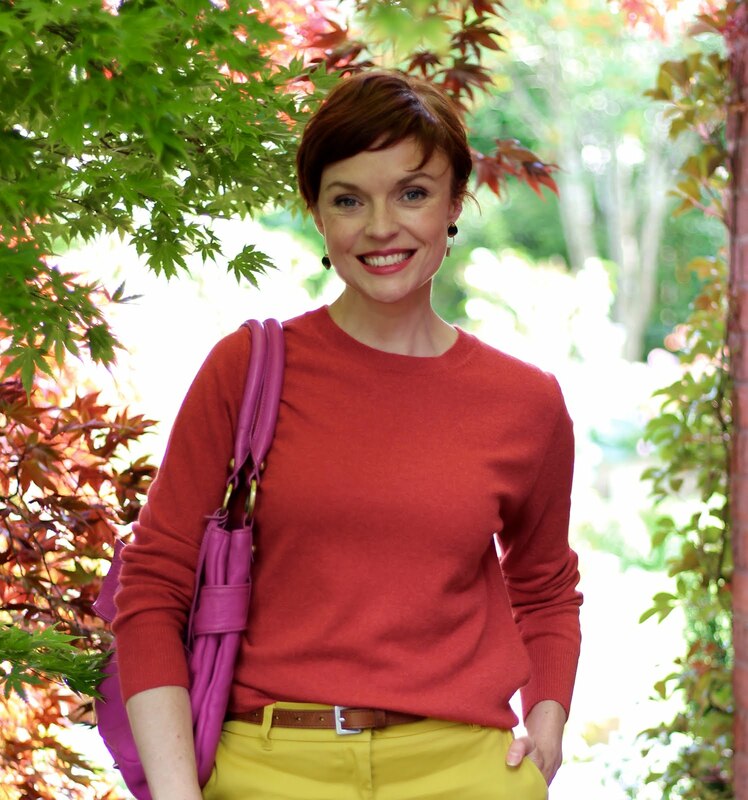 Styled a thousand times before by big bloggers and small. A timeless look that suits all shapes and sizes. An outfit that can be subtly tweaked and modified to suit all tastes. and my trusty leather jacket. Worn to death and still going strong! BOOTS: Dr Martens... these are cool! I love the way you take a dress and jacket combination and playfully make it SO much more interesting and expressive. It's lots more satisfying to wear something that reveals a some inner joy and you set a inspiring creative pace for us Sam! Hahahahaha... maybe Jude BUT her eye rolling skills tell me otherwise! love this outfit and love your attitude!, You look fabulous! 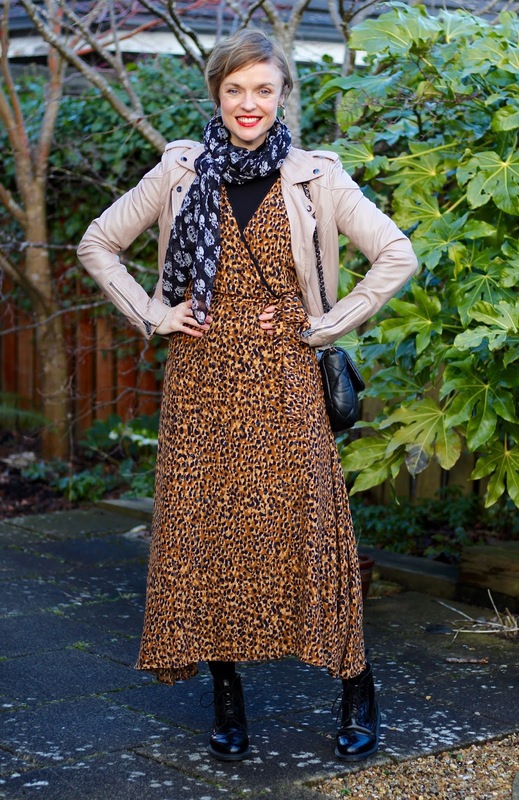 The animal print, the fab scarf, lovely boots and perfect jacket! and matching earrings! Everything rocks! My mum once loved my new haircut and I swiftly changed it!! I love an old jacket. Leather is the best for this isn't it. Are you KIDDING me?? You look FABULOUS! What do kids know, anyway?!? PS - seriously coveting those lace-up doc martens WITH SIDE ZIPPER!!! I cannot do lace-ups these days, I can't stay bent over that long to lace them up, I'd asphyxiate myself and THAT'S not good. But I think I could manage a side zip! I can't be bothered fiddling with laces either, especially on DM's because they are so stiff. But which part of this outfit made her cringe? I'm scratching my head a bit because I think this outfit is AMAZING! First of all, I absolutely love that leopard print dress, I don't know why I never noticed in Zara because if I had, I would've tried it on for sure. Love love LOVE that you paired the dress with those boots, because you just upped the coolness factor here. Would it be correct to say that your daughter would think this ensemble looks smashing on someone else but because you're her mom, it's a little different...? That HAS to be it! PS: The red lips are icing on the cake! To be honest with you I think my girl is at the age where everything I wear makes her cringe. She will get over it in a few years.